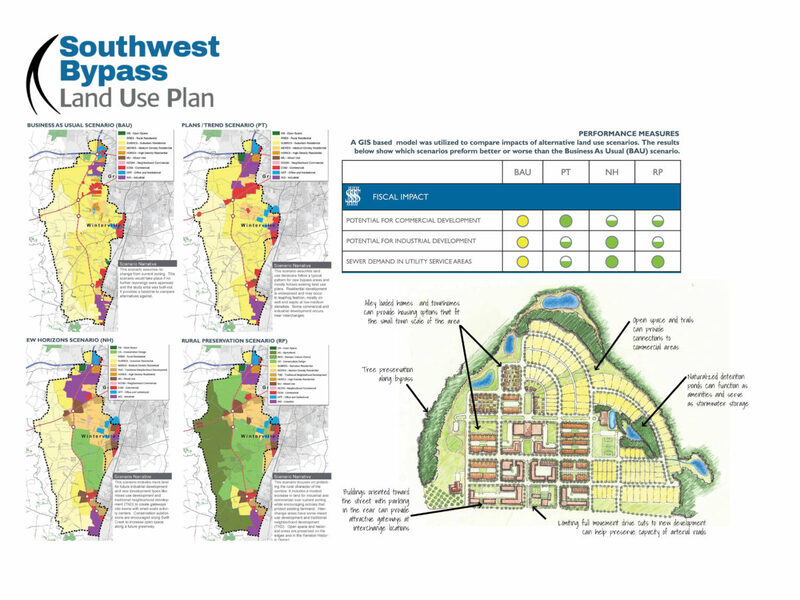 Stewart was engaged by Pitt County (in conjunction with Greenville, Ayden, Winterville and NCDOT) to prepare the Southwest Bypass Corridor Land Use Plan. Pitt County and the surrounding area is experiencing growth in anticipation of the Southwest Bypass. The bypass will improve mobility and alleviate congestion but also presents challenges. Land use policy and regulations currently do address the type, scale and design of non-residential uses typically associated with a transportation facility of the magnitude of the bypass. The intent of the plan is to help local governments take advantage of development opportunities along the corridor. The plan will also ensure that future development is managed appropriately and is compatible with existing communities and long term plans for growth in the County and partner municipalities. The planning effort includes a scenario planning exercise to determine impacts of different land use policies. Stewart created a custom GIS-based forecasting model created using ArcGIS and CommunityViz to provide build-out forecasts for the effort. The preferred scenario will be used as the future land use plan for the county and will inform infrastructure and land use decisions for towns as well.